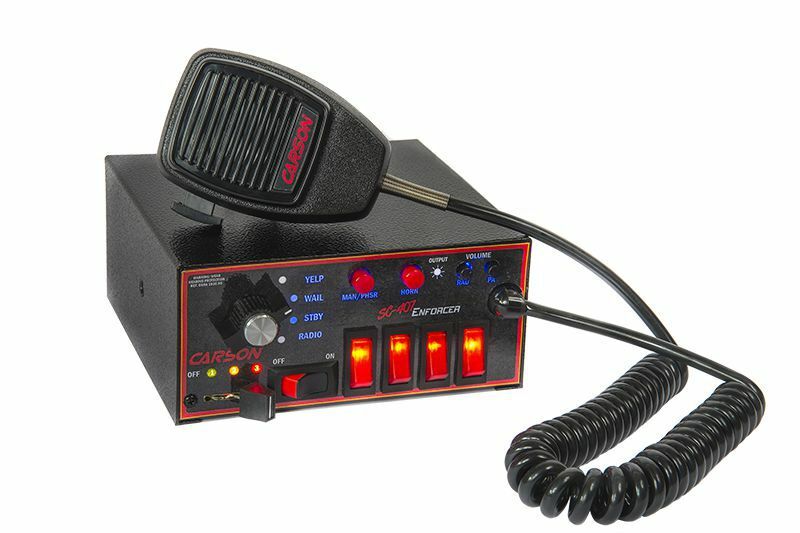 Click the button below to add the Carson SC-407 Enforcer 200w to your wish list. The SC-407 Enforcer Siren features a rugged lever/slide switch for primary light and siren control, 4 lighted rockers for auxiliary lights and equipment and 2 oversized rockers and momentary push buttons for siren tone control, separate volume control knobs for Radio and PA volume control and a noise-canceling PA microphone. Plus it features programmable hands free controls like Horn Ring Cycler (HRC) function that enables the driver to cycle through the siren tones with the vehicles horn and Siren Cutout or Park Kill to disable the siren when exiting the vehicle. Designed to power one or two 100-watt speakers, the SC-407 Enforcer is protected by internal fusing and short circuit, high voltage and reverse polarity protection systems. A wiring connector with screw-down terminals for the siren and mounting brackets for the unit and the PA microphone are included. Lead wires extend out the back for light control and power supply. External fusing for light control is required. As with all Carson Sirens products, the Enforcer is backed by a no-hassle 5-year limited warranty.